Wood carving and craft knives for sale. 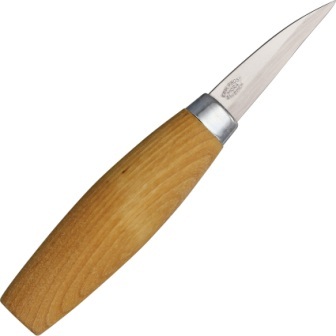 Low prices on wood carving knives, craft knives, wood handle knives, and whittler knives. Limited edition knives and knife sharpeners also available. Overall: 6.5"; Blade: 2.75" | 1075 Carbon Steel | Standard Edge; Other Info: Full Tang. Blasted satin finish Wharncliffe blade. Natural linen micarta handles. Brown leather belt sheath. Boxed. Made in El Salvador. Overall: 7"; Blade: 3" | 1075 Carbon Steel | Standard Edge; Other Info: Full Tang. Blasted satin finish clip point blade. Natural linen micarta handles. Brown leather belt sheath. Boxed. Made in El Salvador. 6.5" overall. 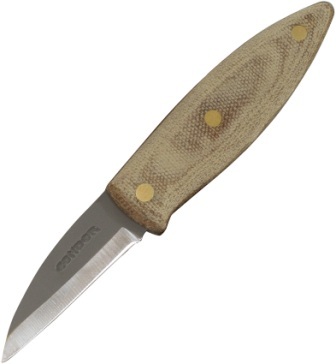 2" Condor classic finish 1075HC steel curved blade. Walnut handle. Boxed. Made in El Salvador. 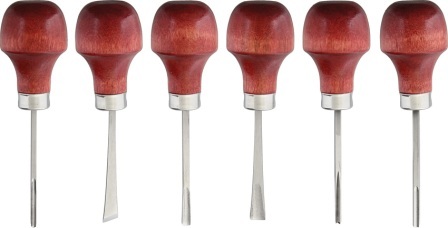 Features beech wood handles with steel ferrules. 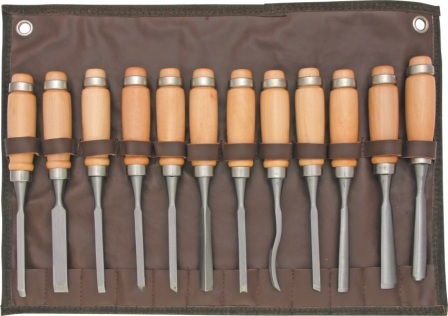 Set includes 6mm straight, 12mm straight, 10mm V-tool, 6mm right skew, 6mm double skew, 8mm gouge, 10mm gouge, 14mm gouge, 6mm spoon, 6mm beading, 6mm round nose, 6mm V-groove, and a leather roll-up pouch. Each chisel measures 7 1/2" overall. Made in China. Each measures 6 3/8" overall. 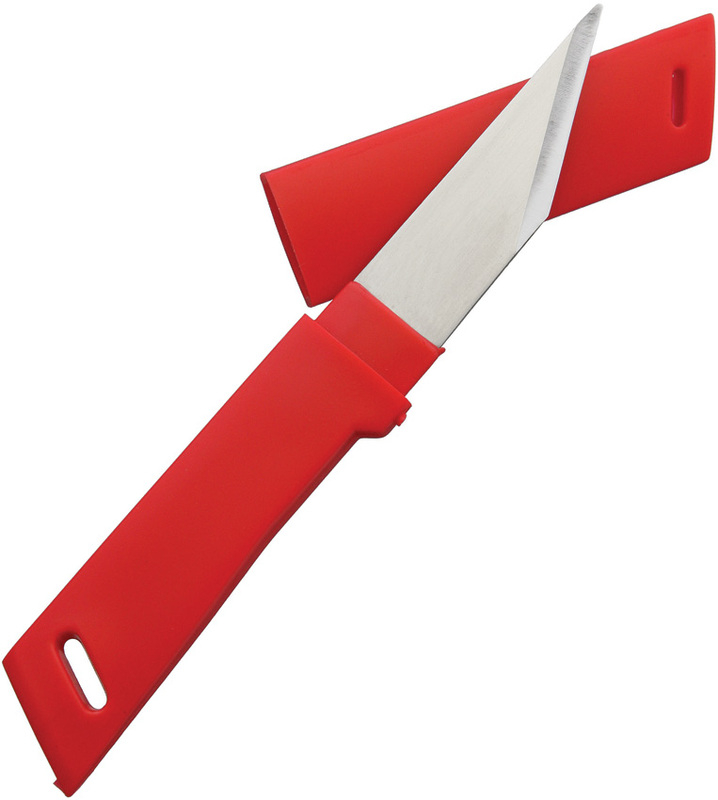 Steel File with red plastic grip. Plastic storage bag. Made in China. 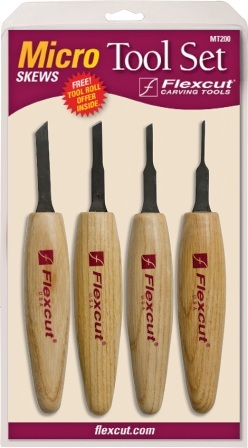 Includes (5) high carbon steel palm tool carving blades - FR308 #2 x 5/16"; FR305 #3 x 3/8"; FR306 #6 x 5/16"; FR309 #11 x 1/8"; FR307 70 deg. x 1/4" and wooden storage box. The wood handles fit comfortably in the palm; allowing for good control close to your work. Great for those just getting started or those with more experience who like to carve smaller size projects. Includes bonus band aid storage container with five standard sized band aids. Made in the USA. Four piece set includes: FR600 #3 x 1/8"; FR601 #5 x 1/8"; FR602 #11 x 1/16"; and FR603 70 deg. x 1/8". High carbon steel blades. Wood handles fit comfortably in the palm. As the name implies, this set was made for miniature carving. 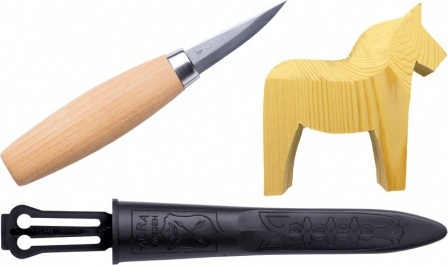 Model-makers, as well as those who enjoy carving fine detail, find these tools quite handy. Ranging in size from 1/8-inch down to 1/16-inch, these tools make others seem like crayons when you really need a sharp pencil. Wooden storage box. Made in the USA. Four piece set includes: FR700 #3 x 7/8"; FR701 #6 x 13/16"; FR702 #8 x 11/16"; and FR703 #9 x 9/16". High carbon steel blades. Wood handles fit comfortably in the palm. These super-wide format tools give maximum wood removal with minimum effort. 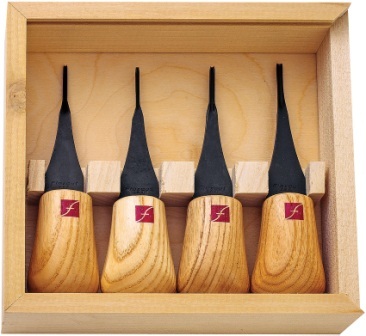 They are designed for carvers with the confidence to hog wastewood off quickly and save roughing-out time. Wooden storage box. Made in the USA. Designed for extreme detail used in netsuke or caricature carving. These tools have their edges forged down even thinner than our other palm tools. Cutting with these fine edges allows the carver to work extremely close to adjacent detail without crushing wood fibers that can lead to "chipping out." Palm Tools included: FR802 #5 x 2.5 mm, FR800 #9 x 1mm, FR801 #9 x 1.5mm, and FR803 45 deg. x 1mm. Comes in wood storage box. Made in the USA. 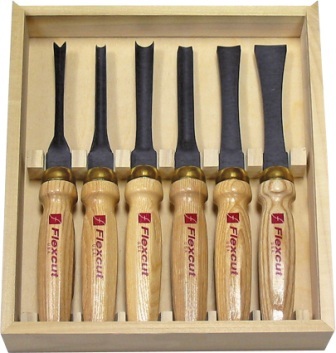 Four piece set includes: FR725 #11X x 3/16"; FR925 #11X x 5/16"; FR926 #11X x 3/8"; and FR927 #11X x 1/2". Wood handles fit comfortably in the palm. 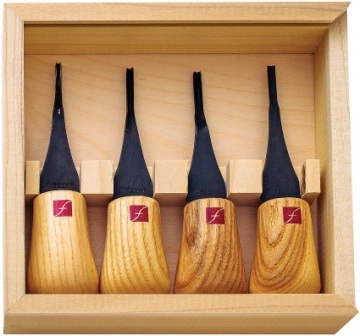 These very deep gouges are designed with a parabolic curve. They are designed to be rolled up to 90 degrees and change shape from a deep #11 to a smooth #3 in one continuous cut. The thumbnail grind keeps the corners from digging into the wood as the tool is rolled. Wooden storage box. Made in the USA. Stainless blade. 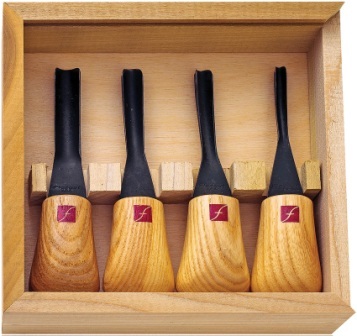 Features broad, short knob Cherry wood handles in the European tradition. Brass ferrule. Includes: #3 x 3/8" (9mm), #6 x 5/16" (8mm), #11 x 1/8" (3mm), #2 x 5/16" (8mm), 70 degree x 1/4" (6mm). Wooden storage box. Made in the USA. Stainless blade. 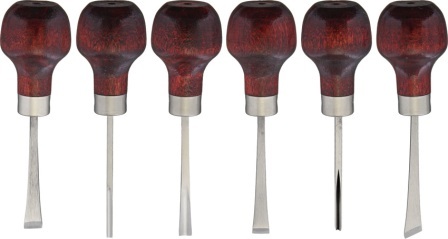 Features broad, short knob Cherry wood handles in the European tradition. Brass ferrule. Includes: #3 x 5/8" (16mm), #5 x 9/16" (14mm), #8 x 3/8" (10mm), 70 degree x 3/8" (9mm). Wooden storage box. Made in the USA. Stainless blade. 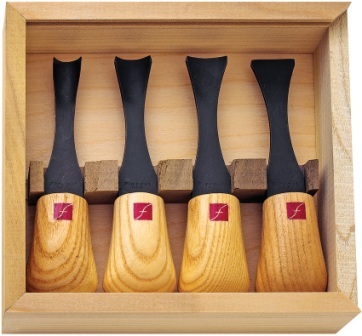 Features broad, short knob Cherry wood handles in the European tradition. Brass ferrule. Includes: #2 x 5/16" (8mm), #3 x 3/8" (9mm), #3 x 5/8" (16mm), #5 x 9/16" (14mm), #6 x 5/16" (8mm), #8 x 3/8" (10mm), #11 x 1/8" (3mm), 70 degree x 1/4" (6mm), 70 degree x 3/8" (9mm). Wooden storage box. Made in the USA. 4 1/4" closed. 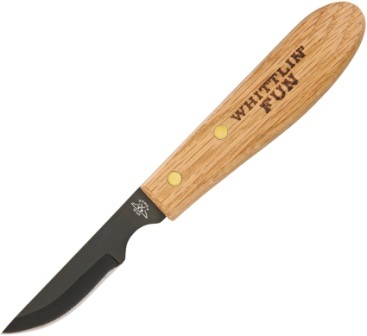 Features 1 1/2" detail blade and 2" roughing blade. Silver aluminum handles with wood inlay. Blades do not lock. Weighs 3 ounces. Hang packaged. 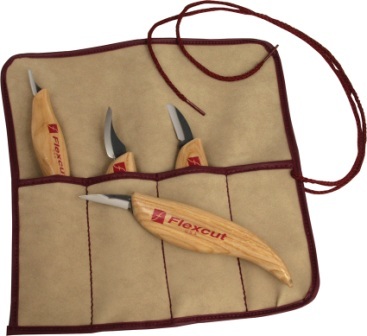 Flexcut carving tools are a new breed of wood carving tools created to address the needs of the modern hobbyist and professional. 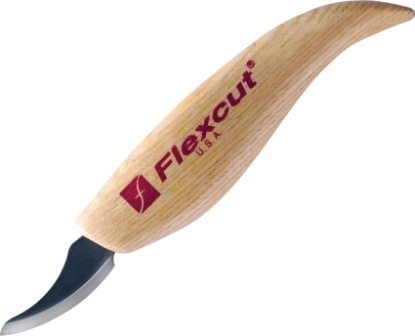 Designed by woodcarvers for woodcarvers, Flexcut features flexible blade shafts with razor sharp cutting edges to give woodcarvers maximum control over each cut. Each blade is precision-machined from high carbon content steel for a hard cutting edge that stays sharp. Each blade is hand-sharpened at the factory and tested before shipping. The tools have ergonomically designed handles that enable long periods of carving without hand fatigue. Made in U.S.A.
4 1/4" closed four blade multi-tool with Detail blade, Straight Gouge, V-Scorp, and Gouge Scorp. Blades lock in closed position. Black aluminum handles with gold etch. Hang packaged. 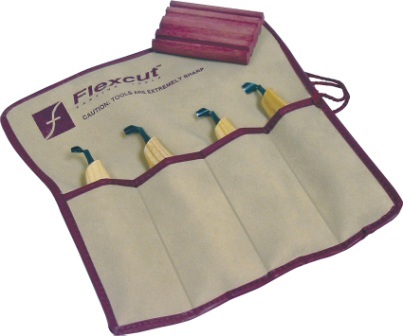 Flexcut carving tools are a new breed of wood carving tools created to address the needs of the modern hobbyist and professional. Designed by woodcarvers for woodcarvers, Flexcut features flexible blade shafts with razor sharp cutting edges to give woodcarvers maximum control over each cut. Each blade is precision-machined from high carbon content steel for a hard cutting edge that stays sharp. Each blade is hand-sharpened at the factory and tested before shipping. The tools have ergonomically designed handles that enable long periods of carving without hand fatigue. Made in U.S.A.
4 1/4" closed six blade multi-tool with two scorps, straight gouge, a hook, chisel, and a detail blade. Blades lock in open or closed position. Black aluminum handles with wood inlay. 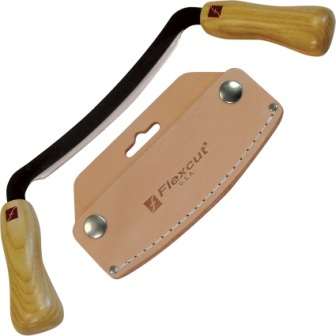 Kit also includes Flexcut Slipstrop, Flexcut Gold polishing compound, and tan leather belt sheath. Hang packaged. Flexcut carving tools are a new breed of wood carving tools created to address the needs of the modern hobbyist and professional. 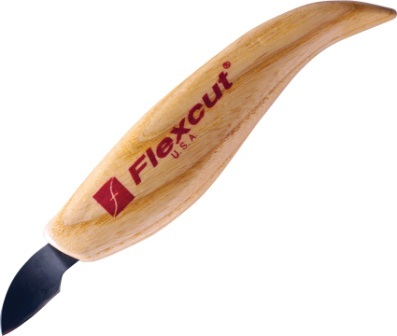 Designed by woodcarvers for woodcarvers, Flexcut features flexible blade shafts with razor sharp cutting edges to give woodcarvers maximum control over each cut. Each blade is precision-machined from high carbon content steel for a hard cutting edge that stays sharp. Each blade is hand-sharpened at the factory and tested before shipping. The tools have ergonomically designed handles that enable long periods of carving without hand fatigue. 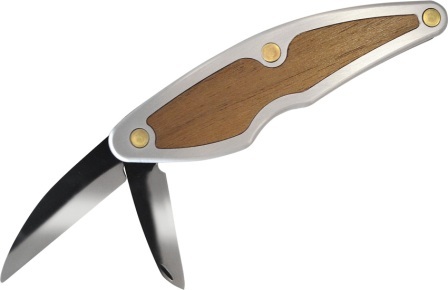 Made in U.S.A.
4 1/4" closed three blade multi-tool with detail, roughing blade and mini cutting blade. Blades lock in the open position. Black aluminum handles with cherry wood inlay. Hang packaged. 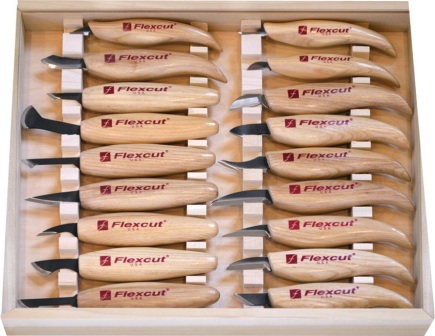 Flexcut carving tools are a new breed of wood carving tools created to address the needs of the modern hobbyist and professional. 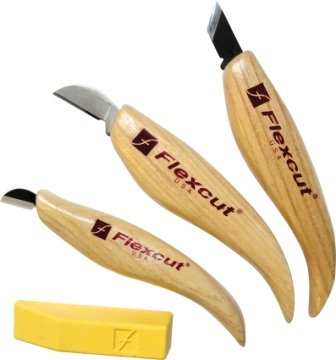 Designed by woodcarvers for woodcarvers, Flexcut features flexible blade shafts with razor sharp cutting edges to give woodcarvers maximum control over each cut. Each blade is precision-machined from high carbon content steel for a hard cutting edge that stays sharp. Each blade is hand-sharpened at the factory and tested before shipping. The tools have ergonomically designed handles that enable long periods of carving without hand fatigue. Made in U.S.A.
4 1/4" closed six blade multi-tool with two scorps, straight gouge, a hook, chisel, and a detail blade. Blades lock in open or closed position. Black aluminum handles with wood inlay. 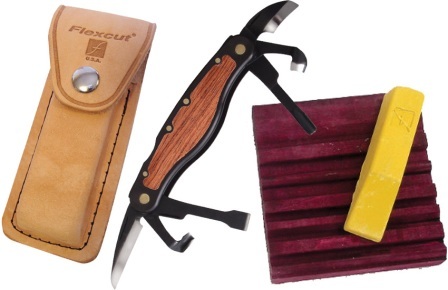 Kit also includes Flexcut Slipstrop, Flexcut Gold polishing compound, and tan leather belt sheath. 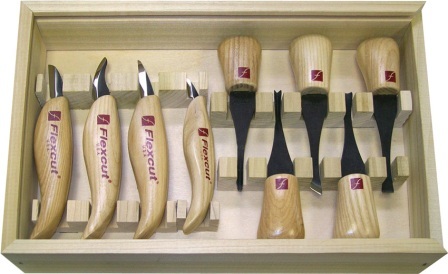 Left-Handed carvers should choose a left-handed tool to cut towards yourself. Choose a right-handed tool to cut away from yourself. Hang packaged. Made in the USA. 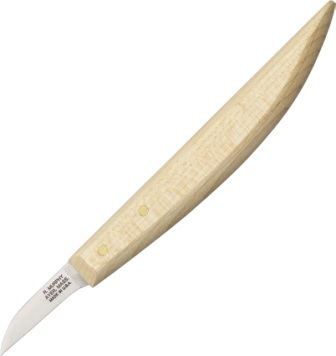 Includes: Cutting Knife - Multi-purpose knife for roughing out and general carving; Detail Knife - The pointed tip allows for working in tight areas of detail; Pelican Knife - The rounded blade cuts in hollow areas and can be used to make rolled, slicing cuts. The relieved back allows the tip to turn in a small radius; Mini Pelican Knife - Ultra thin blade can create extremely fine detail without disturbing adjacent work. Ergonomic wood handles. High carbon steel blades. Comes with 4 pocket tool roll. Hang packaged. 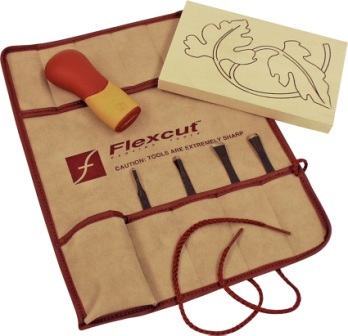 Flexcut carving tools are a new breed of wood carving tools created to address the needs of the modern hobbyist and professional. 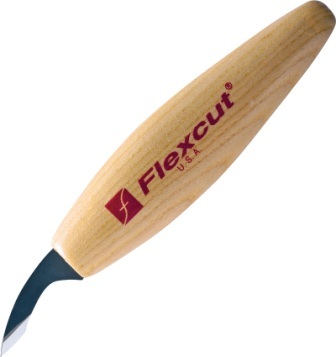 Designed by woodcarvers for woodcarvers, Flexcut features flexible blade shafts with razor sharp cutting edges to give woodcarvers maximum control over each cut. Each blade is precision-machined from high carbon content steel for a hard cutting edge that stays sharp. Each blade is hand-sharpened at the factory and tested before shipping. The tools have ergonomically designed handles that enable long periods of carving without hand fatigue. Made in U.S.A.
5 3/4" overall. 1" high carbon steel blade. 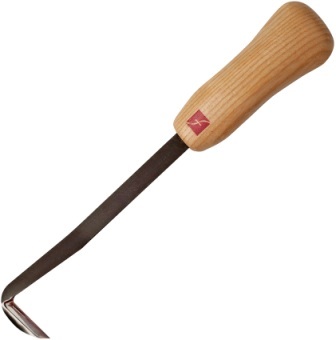 Used for taking more vertical cuts where space is limited for a conventional whittling stroke. Ergonomic wood handle. Also referred to as a Stab Knife. Hang packaged. Made in the USA. Includes KN15 Chip Carving Knife, KN20 Mini Chip Carving Knife, and KN1 1Skew Knife. Ergonomic wood handles. High carbon steel blades. Hang packaged. 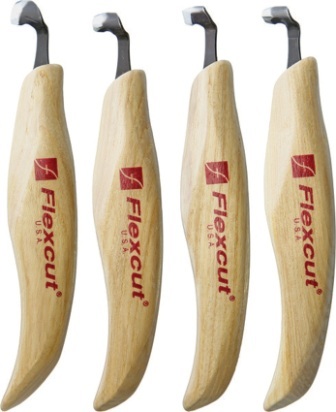 Flexcut carving tools are a new breed of wood carving tools created to address the needs of the modern hobbyist and professional. 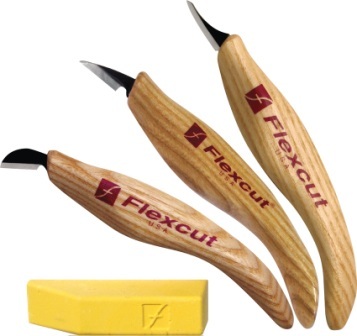 Designed by woodcarvers for woodcarvers, Flexcut features flexible blade shafts with razor sharp cutting edges to give woodcarvers maximum control over each cut. Each blade is precision-machined from high carbon content steel for a hard cutting edge that stays sharp. Each blade is hand-sharpened at the factory and tested before shipping. The tools have ergonomically designed handles that enable long periods of carving without hand fatigue. Made in U.S.A.
6 1/8" overall. 1 1/2" high carbon steel cutting blade for a wide range of carving projects. Ergonomic wood handle. Hang packaged. 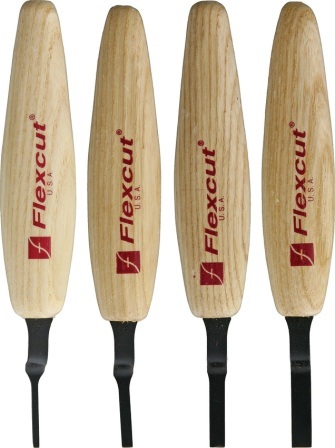 Flexcut carving tools are a new breed of wood carving tools created to address the needs of the modern hobbyist and professional. 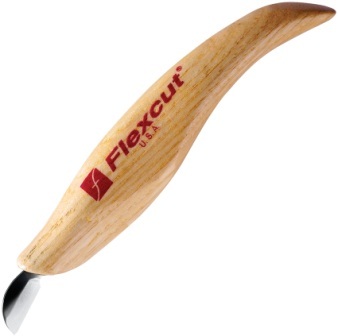 Designed by woodcarvers for woodcarvers, Flexcut features flexible blade shafts with razor sharp cutting edges to give woodcarvers maximum control over each cut. Each blade is precision-machined from high carbon content steel for a hard cutting edge that stays sharp. Each blade is hand-sharpened at the factory and tested before shipping. 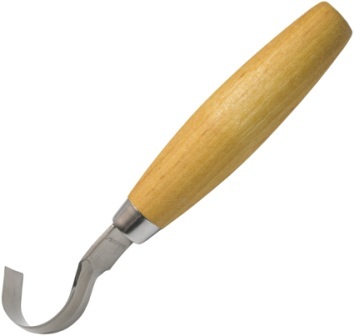 The tools have ergonomically designed handles that enable long periods of carving without hand fatigue. Made in U.S.A.
6 1/8" overall. 1 1/2" high carbon steel detail blade for close work and small details. Ergonomic wood handle. Hang packaged. 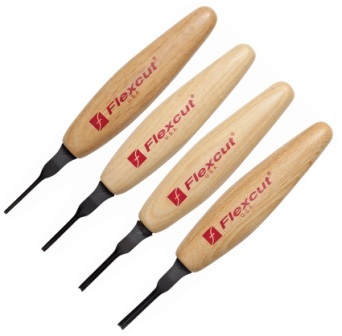 Flexcut carving tools are a new breed of wood carving tools created to address the needs of the modern hobbyist and professional. Designed by woodcarvers for woodcarvers, Flexcut features flexible blade shafts with razor sharp cutting edges to give woodcarvers maximum control over each cut. Each blade is precision-machined from high carbon content steel for a hard cutting edge that stays sharp. Each blade is hand-sharpened at the factory and tested before shipping. The tools have ergonomically designed handles that enable long periods of carving without hand fatigue. Made in U.S.A.
6 1/2" overall. 2" high carbon steel blade. Ergonomic wood handle. Hang packaged. 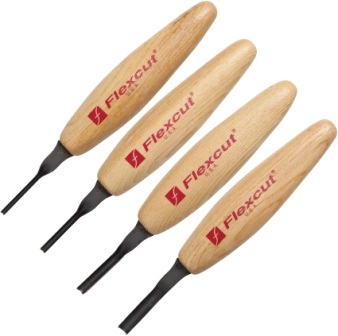 Flexcut carving tools are a new breed of wood carving tools created to address the needs of the modern hobbyist and professional. 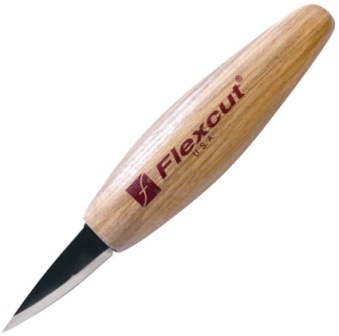 Designed by woodcarvers for woodcarvers, Flexcut features flexible blade shafts with razor sharp cutting edges to give woodcarvers maximum control over each cut. Each blade is precision-machined from high carbon content steel for a hard cutting edge that stays sharp. Each blade is hand-sharpened at the factory and tested before shipping. The tools have ergonomically designed handles that enable long periods of carving without hand fatigue. Made in U.S.A.
5 7/8" overall. 1 1/8" high carbon steel blade. 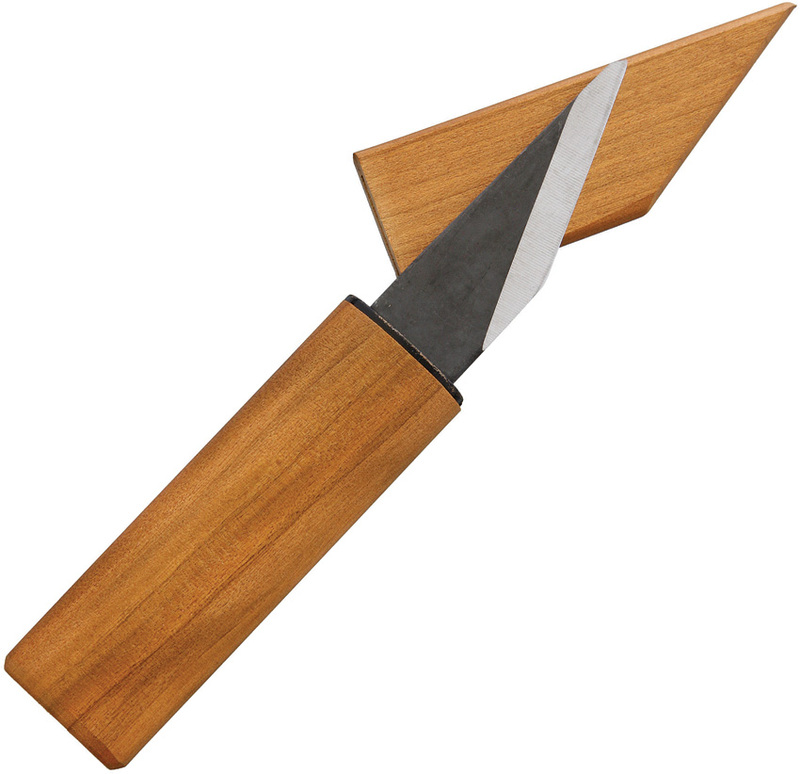 Short-bladed knife used to make triangular shaped cuts to create intricate designs in wood. Designs carved in this fashion are cut into the wood or incised, not relieved. Ergonomic wood handle. Hang packaged. Made in the USA. Includes four right-handed profiles. 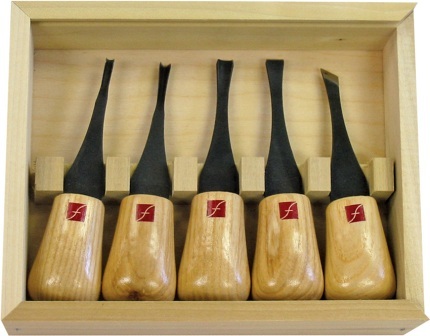 Scorps are essentially right-handed gouges designed for carving areas where the full length of a gouge will not fit. Useful for hollowing deep, narrow cavities. Also includes a leather tool roll and a custom molded strop to maintain your razor-sharp edges. Right-Handed carvers should choose a right-handed tool to cut towards yourself. Choose a left-handed tool to cut away from yourself. Ergonomic wood handle. Hang packaged. Made in the USA. Two 3 3/4" wood handles. 5" of workable edge, designed to flex around contours where large amounts of stock need to be removed quickly. The tool can flex to accomodate concave or convex surfaces. Cuts can be made that conform more closely to the finished shape, taking less time to sand or scrape. Leather sheath. Bulk packed. Flexcut carving tools are a new breed of wood carving tools created to address the needs of the modern hobbyist and professional. 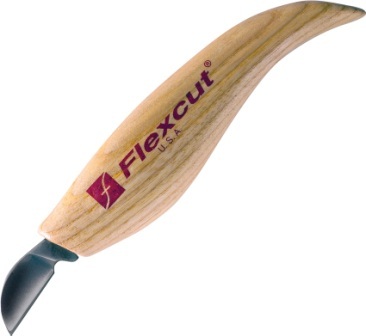 Designed by woodcarvers for woodcarvers, Flexcut features flexible blade shafts with razor sharp cutting edges to give woodcarvers maximum control over each cut. Each blade is precision-machined from high carbon content steel for a hard cutting edge that stays sharp. Each blade is hand-sharpened at the factory and tested before shipping. 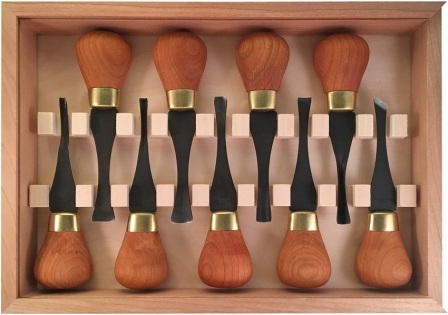 The tools have ergonomically designed handles that enable long periods of carving without hand fatigue. Made in U.S.A.
8 1/2" overall. 1" high carbon steel blade. Contoured wood handle. Designed for hard-to-reach areas, where a pulling action is more conducive to efficient stock removal. The shank allows the cutting angle to be changed easily for contoured cuts. Hang packaged. Made in the USA. 6 3/8" overall. 1 5/8" high carbon steel curved blade. Offers a clean slicing action similar to a skew. The point is narrowed for a tight turning radius while still being durable. It cuts very well in hollow areas. Ergonomic wood handle. Hang packaged. Made in the USA. 5 1/4" overall. 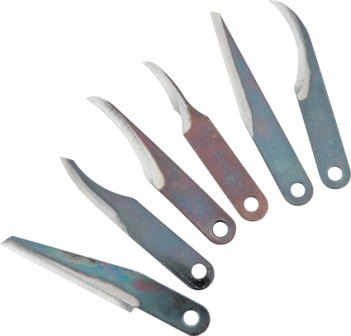 5/8" ultra-thin high carbon steel blade makes unwanted chipping in delicate cuts less likely. Smaller design wood handle is faceted with multiple control points to allow it to be held in a variety of comfortable positions. Hang packaged. Made in the USA. 12 1/8" overall. 3" high carbon steel draw blade. 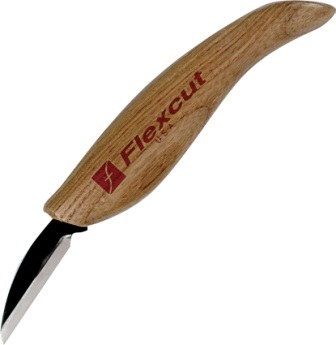 Developed for fan carving but works great for skinning bark and roughing-off corners. Ergonomic wood handles. Tan leather blade cover sheath. Made in the USA. Includes KN11 Skew Knife, KN12 Cutting Knife, KN13 Detail Knife, KN14 Roughing Knife, KN15 Chip Carving Knife, KN18 Pelican Knife, KN19 Mini-Pelican Knife, KN20 Mini-Chip Knife, KN26 Right-Handed Hook Knife, KN27 Mini-Detail Knife, KN28 Upsweep Knife, KN31 Mini-Detail Skew Knife, KN32 Detail Skew Knife, KN33 Hooked Push Knife, KN34 Skewed Detail Knife, KN35 Fine Detail Knife, KN36 Radius Knife and KN37 Hooked Skew Knife, and wooden storage box. 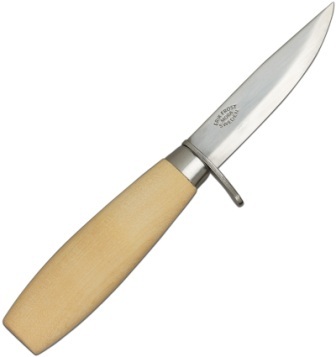 Features high carbon steel blades and wood handles. Set features the most extensive collection of fixed blade carving knives in the industry to give carvers a wide range of capabilities in one economical package. This set includes 18 razor-sharp carving knives designed for roughing to very detailed carving projects. Mail-in offer included in each set for a FREE 18 Pocket Tool Roll! ($30 Value) - Additional Knives NOT included with Free Tool Roll. Made in the USA. 6" overall. 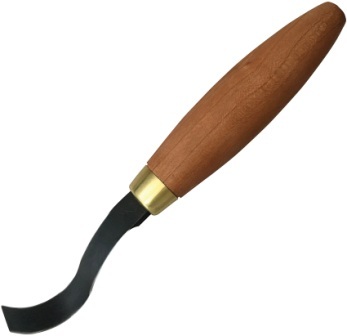 1 1/8" high carbon steel curved, scoop style blade similar to a gouge. Used for working in hollows with ease and fast stock removal. Right-Handed carvers should choose a right-handed tool to cut towards yourself. Choose a left-handed tool to cut away from yourself. Ergonomic wood handle. Hang packaged. Made in the USA. 5 1/4" overall. 3/4" high carbon steel straight blade. Made from ultra-thin material to not disturb adjacent wood for very delicate cuts. Smaller ergonomic wood handle is faceted with multiple control points to allow it to be held in a variety of comfortable positions. Hang packaged. Made in the USA. 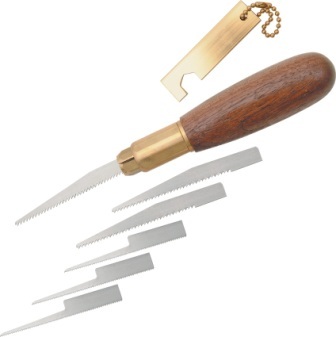 Includes KN13 Detail Knife, KN27 Mini-Detail Knife, and Flexcut Gold polishing compound. Ergonomic wood handles. High carbon steel blades. Hang packaged. 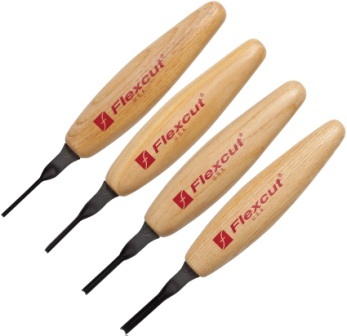 Flexcut carving tools are a new breed of wood carving tools created to address the needs of the modern hobbyist and professional. 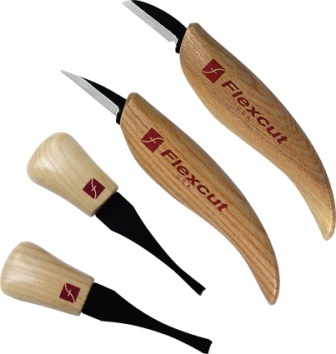 Designed by woodcarvers for woodcarvers, Flexcut features flexible blade shafts with razor sharp cutting edges to give woodcarvers maximum control over each cut. Each blade is precision-machined from high carbon content steel for a hard cutting edge that stays sharp. Each blade is hand-sharpened at the factory and tested before shipping. The tools have ergonomically designed handles that enable long periods of carving without hand fatigue. Made in U.S.A.
5 3/4" overall. 1 1/8" high carbon steel blade. Great for carving eye detail, feathers, cleaning stop cuts and making vertical cuts where space is limited. The extended shank helps for a deeper reach of the blade. Wood handle shape holds like a pencil or conventional knife. Hang packaged. Made in the USA. 6 1/2" overall. 9/16" high carbon steel blade. Great for carving detail, feathers, cleaning stop cuts, and making vertical cuts where space is limited. The extended shank helps for a deeper reach of the blade. Wood handle. Handle shape holds like a pencil or conventional knife. Made in the USA. 6 1/2" overall. 1 7/8" high carbon steel blade. Designed for cleaning stop cuts. For best results, the push blade is great for making concave, convex and shaving cuts. Wood handle shape holds like a pencil or conventional knife. Hang packaged. Made in the USA. 6 1/2" overall. 1 3/4" high carbon steel skewed blade gives the user a different approach to a detail or paring cut. 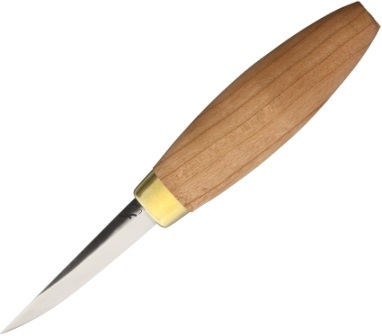 Instead of a perpendicular bevel as found in many detail knives, this instead is slightly skewed. Wood handle shape holds like a pencil or conventional knife. Hang packaged. Made in the USA. 6 1/4" overall. 1 3/8" high carbon steel blade. Designed for making fine detail cuts. The user has the ability to "choke up" on the blade for more precise cuts. Wood handle shape holds like a pencil or conventional knife. Hang packaged. Made in the USA. 6 1/4" overall. 1 1/2" high carbon steel curved bevel blade. Used for making push cuts, slice cuts and v-shaped cuts. The skewed curvature of the bevel allows for a rolling action and allows for a different approach. Wood handle shape holds like a pencil or conventional knife. Hang packaged. Made in the USA. 6 1/2" overall. 1 7/8" high carbon steel blade. 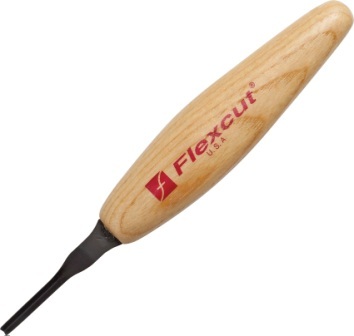 Features a hooked radial bevel and is perfect for waterfowl carving and cleaning. It also can be used to make v-cuts using a rolling action. Wood handle shape holds like a pencil or conventional knife. Hang packaged. Made in the USA. 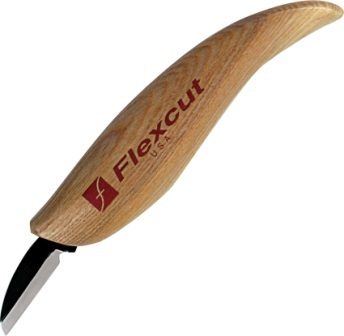 Same high quality as other Flexcut knives; but the blades are smaller, to handle the finest detail work. Includes KN20 Mini-Chip Carving Knife, KN19 Mini Pelican Knife, FN27 Mini Detail Knife, and Flexcut Gold polishing compound. Ergonomic wood handles. High carbon steel blades. Hang packaged. 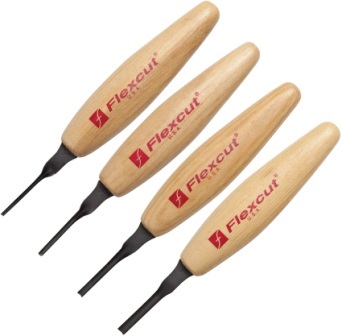 Flexcut carving tools are a new breed of wood carving tools created to address the needs of the modern hobbyist and professional. 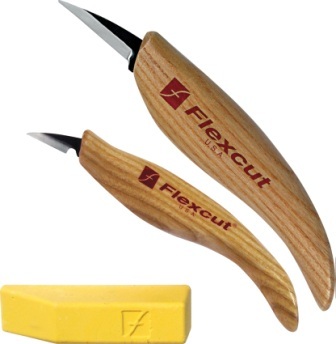 Designed by woodcarvers for woodcarvers, Flexcut features flexible blade shafts with razor sharp cutting edges to give woodcarvers maximum control over each cut. Each blade is precision-machined from high carbon content steel for a hard cutting edge that stays sharp. Each blade is hand-sharpened at the factory and tested before shipping. The tools have ergonomically designed handles that enable long periods of carving without hand fatigue. Made in U.S.A.
Sloyd Knife. 7.5" overall. 2.88" carbon steel blade. Wood handle. Tan leather belt sheath. Hang packaged. Made in the USA. Includes KN12 Cutting Knife, KN13 Detail Knife, KN14 Roughing Knife, and Flexcut Gold polishing compound. Ergonomic wood handles. High carbon steel blades. Hang packaged. Flexcut carving tools are a new breed of wood carving tools created to address the needs of the modern hobbyist and professional. 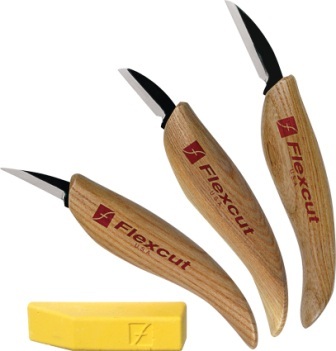 Designed by woodcarvers for woodcarvers, Flexcut features flexible blade shafts with razor sharp cutting edges to give woodcarvers maximum control over each cut. Each blade is precision-machined from high carbon content steel for a hard cutting edge that stays sharp. Each blade is hand-sharpened at the factory and tested before shipping. The tools have ergonomically designed handles that enable long periods of carving without hand fatigue. Made in U.S.A.
8.5" overall. Cherry wood handle. Ideal for carving spoons, bowls, ladles, and other deep hollowed work. Double-sided blade with square, sharpened end. Full tang. Brass ferrule. Hang packaged. Made in the USA. 6.75" overall. Cherry wood handle. Deeply curved, single-edged stainless blade is sharpened all the way to the pointed tip. Full tang. Brass ferrule. Clam packed. Made in the USA. 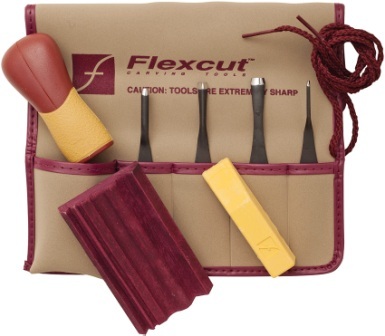 Four piece set includes KN12 Cutting Knife, KN13 Detail Knife, FR306 Palm Tool and FR307 Palm Tool. Palm Tools fit comfortably in the palm of your hand. Great for small projects such as caricatures, walking sticks, and tableware. Palm Tools are shorter in length, offering greater control with the cutting edge closer to the controlling hand. Ergonomic wood handles. High carbon steel blades. Hang packaged. 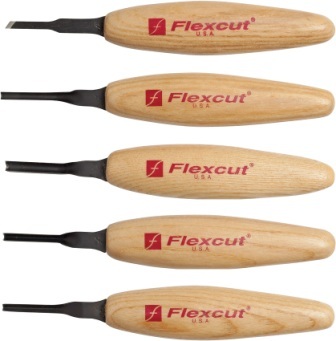 Flexcut carving tools are a new breed of wood carving tools created to address the needs of the modern hobbyist and professional. 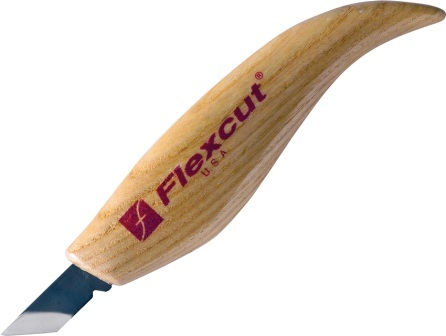 Designed by woodcarvers for woodcarvers, Flexcut features flexible blade shafts with razor sharp cutting edges to give woodcarvers maximum control over each cut. Each blade is precision-machined from high carbon content steel for a hard cutting edge that stays sharp. Each blade is hand-sharpened at the factory and tested before shipping. The tools have ergonomically designed handles that enable long periods of carving without hand fatigue. Made in U.S.A.
Includes (4) knives - KN12 Cutting Knife, KN13 Detail Knife, KN18 Pelican Knife and KN27 Mini-Detail Knife, and (5) palm tools - FR305 #3 x 3/8" Gouge, FR306 #6 x 5/16" Gouge, FR307 70 deg. 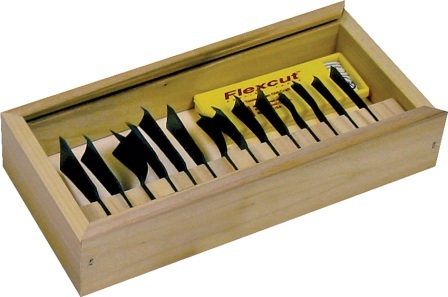 x 1/4" V-Tool, FR308 #2 x 5/16" Skew and FR309 #11 x 1/8" Gouge, and wooden storage box. 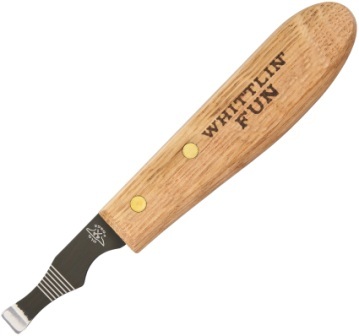 Features high carbon steel blades and wood handles. 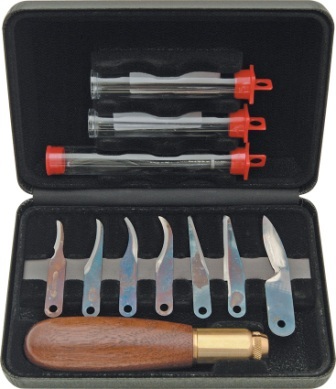 This set brings together two popular tool sets to give carvers a wide range of capabilities. Includes bonus band aid storage container with five standard sized band aids. Made in the USA. Includes four left-handed profiles (#11 x 1/8"; #11 x 3/16"; #6 x 3/8"; 70 degree x 1/4"). Solid ash handles. High carbon steel. Also includes four pocket tool roll. Clam packed. Made in the USA. 6" overall. 1 3/8" high carbon steel left handed hook blade. 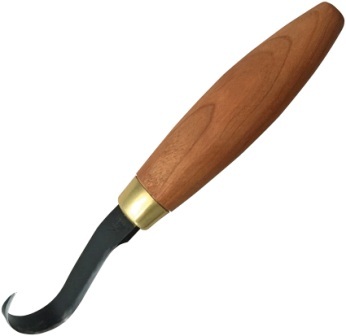 Curved blade, similar to a gouge, is ideal for working in hollows with ease and for fast stock removal. Wood handle. Left-Handed carvers should choose a left-handed tool to cut towards yourself. Choose a right-handed tool to cut away from yourself. Ergonomic wood handle. Hang packaged. Made in the USA. Ten piece set includes: MC203 #3 x 1/2"; MC403 #3 x 1"; MC505 #5 x 1-3/16"; MC307 #7 x 11/16"; MC309 #9 x 1/2"; MC511 #10 x 3/4"; MC211 #11 x 1/8"; MC311 #11 x 1/4"; MC245 45 deg. x 3/16"; and MC460 60 deg. x 1/2". 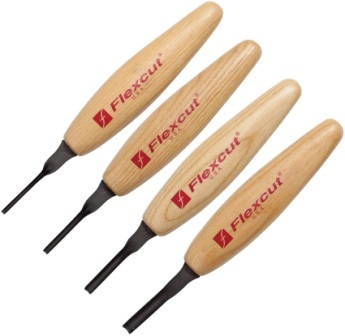 Versatile gouges range from 1/8" for detail to 1 1/4" for hogging off large amounts of waste wood. Ideal for carving large projects or denser hardwoods. Ash handles. 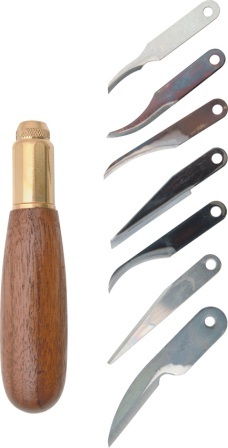 These tools can be used by hand or can be struck with a mallet and will suit the needs of advanced and beginning carvers. Wood storage box. Made in the USA. Includes (6) mallet tools - MC403 #3 x 1"; MC305 #5 x 11/16"; MC208 #7 x 7/16"; MC311 #11 x 1/4"; MC411 #10 x 9/16"; MC360 60 deg. x 3/8" and wooden storage box. 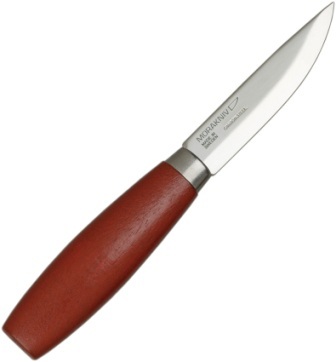 Features high carbon steel blades and wood handles. A good sampling of tools to get started on simpler projects. These tools can be used by hand or can be struck with a mallet and will suit the needs of advanced and beginning carvers. Includes bonus band aid storage container with five standard sized band aids. Made in the USA. Four Piece Set. Sized for very large stock removal. Handle diameter and steel caliper are twenty percent larger for heavy duty projects. These tools can be used by hand or can be struck with a mallet. Mallet Tools included: MC803 #3 x 2"; MC605 #5 x 1-3/8"; MC711 #10 x 1-1/8"; and MC890 90 deg. x 1-3/8". Comes in wood storage box. Made in the USA. 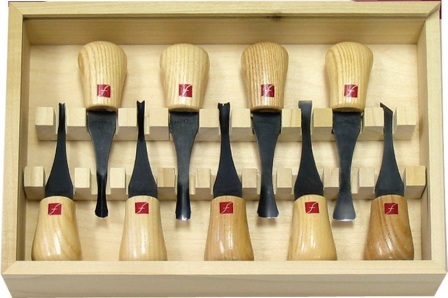 This set features four micro chisels. Micro Tools included: MT11 1/16" (1.5mm), MT12 1/8" (3mm), MT13 3/16" (5mm), and MT14 1/4" (6mm). Perfect for: miniature and fine detail work, cleaning up ridges created by gouge cuts, cleaning up tight corners and accessing tight spaces. Hang packaged. Made in the USA. 5 1/2" overall. High carbon steel shaft with 1/8" (3mm) sharpened micro chisel point tip. Ergonomic wood handle. Perfect for: Miniature and fine detail work; Cleaning up ridges created by gouge cuts; Cleaning up tight corners; Accessing tight spaces; and Carving fine details such as mouths and eyes, plus adding texture such as hair, fur and feathers. Hang packaged. Made in the USA. 5 5/8" overall. 1 5/8" high carbon steel blade. Used for cleaning up ridges created by gouge cuts, for cleaning up tight corners, accessing tight spaces and for miniature and fine detail work. Great for carving fine details such as mouths and eyes, plus adding texture such as hair, fur and feathers. Wood handle shape holds like a pencil or conventional knife. Hang packaged. Made in the USA. Overall: 5.5"; Blade: Stainless; Handle: Brown | Wood; Other Info: Contains MT46 6mm, MT45 5mm, MT44 3mm, and MT43 1.5mm. Good for miniature and fine detail work, cleaning up ridges, cleaning up tight corners, and adding fine details. HangÊPackaged. Made in USA. 5 5/8" overall. 1 3/4" high carbon stainless blade. Wood handle. Used for miniature and fine detail work, cleaning up ridges created by gouge cuts, cleaning up tight corners, accessing tight spaces, and carving fine details such as mouths and eyes. Hang packaged. Made in the USA. This set features four micro skews. Micro Tools include: MT15 1/16" (1.5mm), MT16 1/8" (3mm), MT17 3/16" (5mm), and MT18 1/4" (6mm). Perfect for miniature and fine detail work, cleaning up ridges created by gouge cuts, cleaning up tight corners and accessing tight spaces. Hang packaged. Made in the USA. 5 3/4" overall. 1 3/4" high carbon stainless blade. Wood handle. Used for miniature and fine detail work, cleaning up ridges created by gouge cuts, cleaning up tight corners, accessing tight spaces, and carving fine details such as mouths and eyes. Hang packaged. Made in the USA. 1.5mm Micro Deep U-Gouge. Made in the USA. 5 1/2" overall. 1 3/4" high carbon stainless blade. Wood handle. Used for miniature and fine detail work, cleaning up ridges created by gouge cuts, cleaning up tight corners, accessing tight spaces, and carving fine details such as mouths and eyes. Hang packaged. Made in the USA. Set includes MT 19-1.5mm; MT20- 2mm; MT21- 3mm; MT22- 4mm. Each tool is 5 1/2" overall with a 1 3/4" high carbon steel blade and wood handle. Used for miniature and fine detail work, cleaning up ridges created by gouge cuts, cleaning up tight corners, accessing tight spaces, and carving fine details such as mouths and eyes. Hang packaged. Made in the USA. 5 3/4" overall. 1 3/4" high carbon steel blade. Wood handle. Used for miniature and fine detail work, cleaning up ridges created by gouge cuts, cleaning up tight corners, accessing tight spaces, and carving fine details such as mouths and eyes. Hang packaged. Made in the USA. 5 5/8" overall. 1 3/4" high carbon steel blade. Wood handle. Used for miniature and fine detail work, cleaning up ridges created by gouge cuts, cleaning up tight corners, accessing tight spaces, and carving fine details such as mouths and eyes. Hang packaged. Made in the USA. Set includes MT 23- 1.5mm; MT24- 2mm; MT25- 3mm; MT26- 4mm. Each tool is 5 3/4" overall with a 1 3/4" high carbon steel blade and wood handle. Used for miniature and fine detail work, cleaning up ridges created by gouge cuts, cleaning up tight corners, accessing tight spaces, and carving fine details such as mouths and eyes. Hang packaged. Made in the USA. 5 3/4" overall. 1 3/4" high carbon steel blade. Wood handle. Used for miniature and fine detail work, cleaning up ridges created by gouge cuts, cleaning up tight corners, accessing tight spaces, and carving fine details. Hang packaged. Made in the USA. Set includes MT 27- 1.5mm; MT28- 2mm; MT29- 3mm; MT30- 4mm. 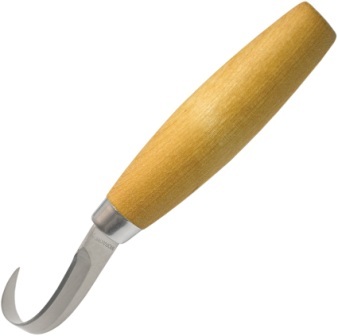 Each tool features 1 3/4" high carbon steel blade and wood handle. Used for miniature and fine detail work, cleaning up ridges created by gouge cuts, cleaning up tight corners, accessing tight spaces, and carving fine details such as mouths and eyes. Hang packaged. Made in the USA. Set includes MT31- 1.5mm; MT32- 2mm; MT33- 3mm; MT34- 4mm. 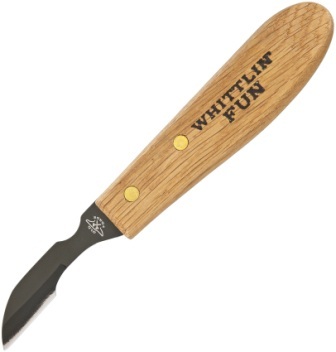 Each tool features a 1 3/4" high carbon steel blade and wood handle. Used for miniature and fine detail work, cleaning up ridges created by gouge cuts, cleaning up tight corners, accessing tight spaces, and carving fine details such as mouths and eyes. Hang packaged. Made in the USA. Set includes MT 35- 1.5mm; MT36- 2mm; MT37- 3mm; MT38- 4mm. Each tool is 5 3/4" overall with a 1 3/4" high carbon steel blade and wood handle. Used for miniature and fine detail work, cleaning up ridges created by gouge cuts, cleaning up tight corners, accessing tight spaces, and carving fine details such as mouths and eyes. Hang packaged. Made in the USA. Set includes MT 39- 1.5mm; MT40- 2mm; MT41- 3mm; MT42- 4mm. Each tool is 5 1/2" overall with a 1 3/4" high carbon steel blade and wood handle. Used for miniature and fine detail work, cleaning up ridges created by gouge cuts, cleaning up tight corners, accessing tight spaces, and carving fine details such as mouths and eyes. Hang packaged. Made in the USA. 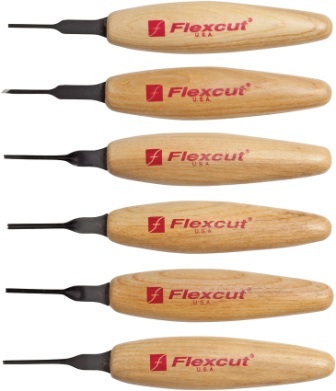 Includes six 1.5mm Profiles: Chisel (FLEXMT11), Skew (FLEXMT15), Sweep, Deep-U, 45° V and 90° V. These tools are designed to handle the extra-fine details often encountered in woodcarving. Perfect for miniatures, cleaning up ridges created by gouge cuts, cleaning up and accessing tight corners, and carving fine details such as mouths and eyes, plus adding texture such as fur and feathers. Hang packaged. Made in the USA. 5.5" overall. Stainless blade. Wood handle. Includes MT16 Skew, MT21 Sweep, MT29 Deep-U, MT33 45 degree V, MT41 90 degree V. Clam packed. Made in the USA. Designed for quickly maintaining a sharp edge. Specially formulated to apply like a crayon. Blend of aluminum and titanium oxide provides a balance between aggressive removal of hardened tool steels and offers a high-color polish. 6 oz. bar. Hang packaged. Made in the USA. 14 Piece Set includes: RG305 #3 x 3/8"; RG400 #3 x 5/8"; RG300 #3 x 3/4"; RG200 #3 x 1"; RG306 #5 x 5/16"; RG401 #5 x 9/16"; RG301 #5 x 5/8"; RG201 #5 x 7/8"; RG402 #8 x 3/8"; RG302 #8 x 1/2"; RG309 #11 x 1/8"; RG307 70 deg. x 1/4"; RG403 70 deg. x 3/8"; RG203 90 deg. x 11/16". Ideal for roughing out and detailing. Compatible with most reciprocating power tools, and requires no adapters for the following machines: Proxxon; Foredom; Wecheer; Ryobi and MasterCarver. USA Wooden storage box. Made in the USA. Includes (4) razor sharp carving blades - SK305 #3 x 3/8"; SK306 #6 x 5/16"; SK801 #9 x 1.5mm and SK307 70 deg. x 1/4" profiles; (1) Quick-Change ABS handle; pre-printed leaf carving blank; eleven pocket tool roll; sharpening and carving manual. Hang packaged. Ideal for wood carving; texturing; surfaces; foam; linoleum block; melons and soap. Made in the USA. Includes (10) high carbon steel razor sharp carving blades - SK329 #1 x 1/4"; SK305 #3 x 3/8"; SK400 #3 x 5/8"; SK401 #5 x 9/16"; SK306 #6 x 5/16"; SK801 #9 x 1.5mm; SK309 #11 x 1/8"; SK408 #11 x 1/4"; SK803 45 deg. x 1mm and SK307 70 deg. x 1/4" profiles; (1) Quick-Change ABS handle; pre-printed leaf carving blank; eleven pocket tool roll; sharpening and carving manual. Hang packaged. Ideal for wood carving; texturing; surfaces; foam; linoleum block; melons and soap. Made in the USA. Includes (16) high carbon steel carving knives - SK406 #1 x 5/8"; SK407 #2 x 9/16"; SK323 #3 x 1/4"; SK700 #3 x 7/8"; SK601 #5 x 1/8"; SK446 #6 x 1/2"; SK428 #8 x 1/4"; SK402 #8 x 3/8"; SK702 #8 x 11/16"; SK703 #9 x 9/16"; SK602 #11 x 1/16"; SK725 #11X x 3/16"; SK927 #11X x 1/2"; SK317 45 deg. x 5/32"; SK403 70 deg. x 3/8" and SK754 7/8" Back Bent profiles; cutting knife; (2) Quick-Change handles (ABS and Power); SlipStrop with Gold polishing compound; instruction manual and 90m instructional DVD. Includes bonus band aid storage container with five standard sized band aids. Made in the USA. Includes six high carbon steel scraper blades and interchangeable wood power handle. Designed to remove any uneven surface or finish from woodcarving work without the use of expensive sandpaper which can create airborne dust. Ideal to remove: roughness on hand or power carving; ripple marks from moulding operations; excess glue in hard-to-reach areas; unwanted paint or other finishes. Hang packaged. Made in the USA. Relief printing is based on a reductive process - carve the non-image away from a flat, level surface and ink the remaining top surface with a roller or brayer in order to print the image. Set contains 4 carving blades, a quick-connect ABS handle, 11-pocket tool roll, as well as a custom strop and polishing compound. Profiles included: SK306 #6 x 5/16"; SK309 #11 x 1/8"; SK803 45 deg. x 1mm; and SK307 70 deg. x 1/4". Hang packaged. Made in the USA. 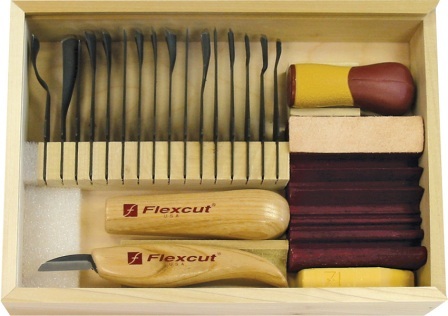 Conveniently organize and protect carving tools. 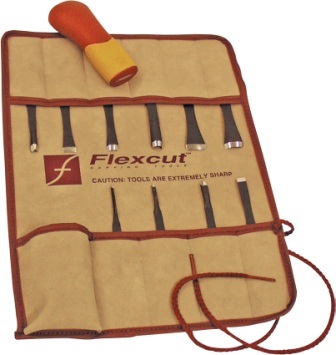 This tool roll will accept up to 18 SK unhandled gouges and 1 interchangeable handle. A corded tie string keeps the roll secured to protect tools during transportation or storage. Hang packaged. Made in the USA. 6 3/4" overall. 3" carbon steel blade. Red wooden handle. Molded black composition belt sheath with water drain hole. Ideal for carpenters and wood carvers. Bulk packed. Made in Sweden. Includes Pro S fixed blade. 8" overall with 3.63" stainless blade. Black and blue rubberized handle. 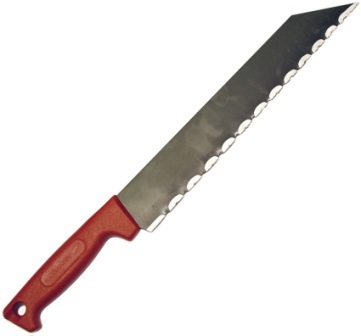 Also includes 7.63" chisel with 3" blunt tip carbon steel blade. Black and green rubberized handle. 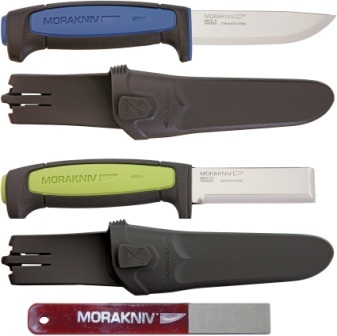 Both include black plastic Combi-Sheath (which allows for connection of secondary knife and sheath). Features 6" overall fine (600) diamond sharpener. Clam packed. Made in Sweden. 6 1/2" overall. 3" carbon steel blade. Wood handle with stainless guard. Black molded plastic belt sheath. Hang packaged. Made in Sweden. 7.38" overall. 3" stainless blade. Black polypropylene handle. Black polypropylene belt sheath. Bulk packed. Made in Sweden. No. 120. 6.75" overall wood carving knife with 2.25" laminate VG-2 stainless blade and birch wood handle. Also includes Dala horse material made of Scandinavian pine. 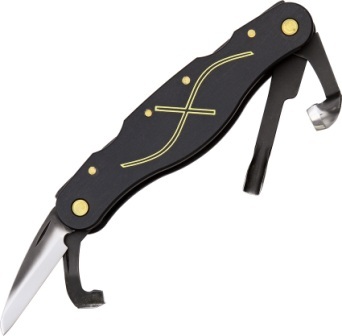 Black synthetic belt sheath. Boxed. Made in Sweden. 6.25" overall. 2.25" stainless blade. Brown wood handle. U-shaped double edge blade. Clam packed. Made in Sweden. 7" overall. 2.88" stainless blade. Brown wood handle. Double edge U-shaped blade. Hang packaged. Made in Sweden. 6.25" overall. 2" stainless blade. Brown wood handle. Single edge U-shaped blade. Clam packed. Made in Sweden. 6 3/4" overall. 2 1/4" thin design, tapered laminated steel blade. Oiled birchwood handle. Black composition belt sheath with water drain hole. Bulk packed. Made in Sweden. Professional Grade. 7 1/4" overall. 2 1/2" carbon steel hawkbill blade. Ergonomic red composition handle with finger guard designed to provide maximum pulling force. Oversized lanyard hole. Black composition belt sheath. Weight: 3.1 oz. Bulk packed. Made in Sweden. 14 3/8" overall. 4 1/2" single edge carbon steel blade. Oiled birchwood handles. Used by carpenters and wood carvers. Bulk packed. Made in Sweden. 14" overall. 4 1/2" single edge carbon steel wood splitting blade. Red finish ochre birchwood handles. Used by carpenters and wood carvers. Bulk packed. Made in Sweden. 7 1/2" overall. 3" thin, tapered, laminated steel blade. Black composition belt sheath. Oiled birchwood handle. Bulk packed. Made in Sweden. 8" overall. 3 1/8" thin, tapered, laminated steel blade. Large design handle. Black composition belt sheath. Oiled birchwood handle. Bulk packed. Made in Sweden. 6 5/8" overall. 2 1/4" thin, tapered, laminated steel blade. Black composition belt sheath. Oiled birchwood handle. Bulk packed. Made in Sweden. 6 3/4" overall. 3" carbon steel blade. Round design oiled birchwood handle. Polished finish bolster and finger guard. Molded black composition belt sheath with water drain holes. 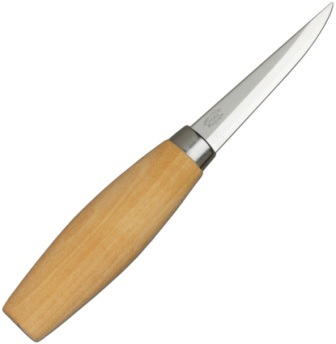 Ideal as a woodcarving knife for children. Bulk packed. Made in Sweden. Professional grade. 19 3/4" overall. 13 3/4" serrated stainless blade. Oversized red plastic handle with integrated finger guard and oversized lanyard hole. Weight: 8.4 oz. Bulk packed. Made in Sweden. 6.5" overall. 2.75" SK5 carbon steel blade. Cherry wood handle. Bulk packed. Made in Japan. 6.5" overall. 2.5" 420J2 stainless blade. 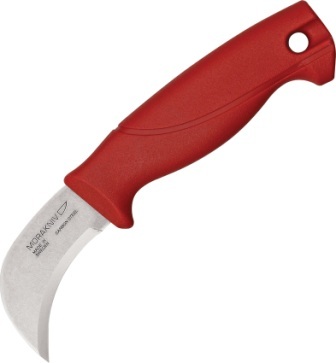 Red polypropylene handle. Red polypropylene sheath. Bulk packed. Made in Japan. Japanese carving and outdoor folding knife with locking blade. The 120 mm blade is made of Blue Paper Steel at HRC 64 and 2 mm thick. The handle is make of Japanese Cherry wood. The knife weighs 80 g and comes in a blister package. Made in Japan. Japanese carving and outdoor folding knife with locking blade. The 120 mm blade is made of Blue Paper Steel at HRC 64 and 2.2 mm thick. The handle is make of Japanese Cherry wood. The knife weighs 80 g and comes in a blister package. Made in Japan. 7 7/8" overall. 3 1/8" black finish high carbon steel blade with 2 1/8" cutting edge. Ergonomic natural wood handle. Perfect for removing large amounts of material or just whittling on the front porch. Hang packaged. Made in China. 7 1/8" overall. 2 1/2" black finish high carbon steel blade with 1 1/8" cutting edge. Ergonomic natural wood handle. Perfect for carving all those small details into your project. It helps put the finishing touches on your masterpiece. Hang packaged. Made in China. 6 5/8" overall. 1 7/8" black finish high carbon steel blade with 3/8" cutting edge. Ergonomic natural wood handle. Used to remove large chunks of wood, making flat cuts and smoothing out your project. It's perfect for that touch up work as well. Hang packaged. Made in China. Set includes (1) 7 7/8" overall whittler with 3 1/8" blade and 2 1/8" cutting edge, (1) 7 1/8" overall detail knife with 2 1/2" blade and 1 1/8" cutting edge and (1) 6 5/8" overall chisel with 1 7/8" blade and 3/8" cutting edge. 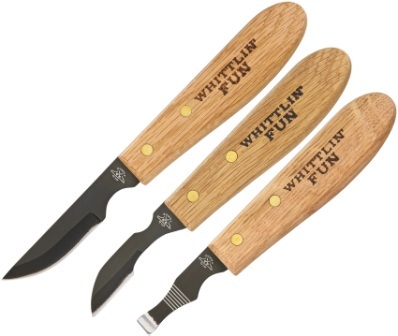 Wood carving knives feature black finish high carbon steel blades and ergonomic natural wood handles. Embroidered black nylon belt sheath holds all. Made in China. Overall: 6.5"; Blade: 1.875" l Stainless l Standard Edge l Mirror Polish Finish; Other Info: Cherry wood handle. Bulk Packed. Made in Germany. Overall: 6.875"; Blade: 1.75" l Carbon Steel l Standard Edge l Satin Finish; Handle: Wood; Bulk Packed. Made in Germany. 6 5/8" overall. 1 1/2" high carbon steel blade. Natural color hardwood riveted handle. Made in the USA. 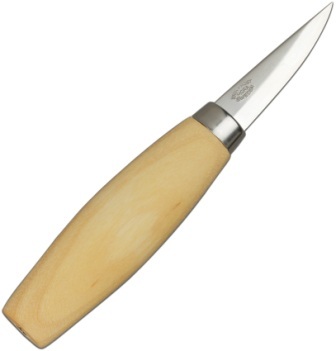 Contains twelve wood carving knives with 4 1/4" natural wood handles and assorted tips. 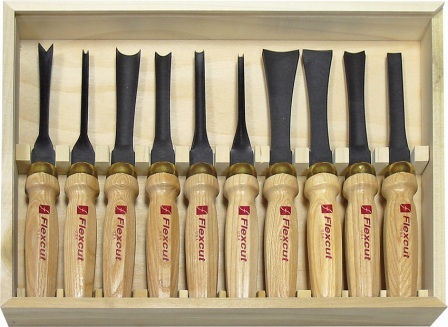 Ideal for beginner/intermediate or advanced carvers. Deluxe black nylon storage case with red felt lining. Bulk packed. Made in China. Carbon steel blade. Wood handle. 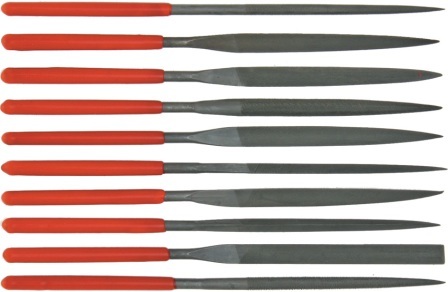 Pack of 6 small detail blades: 5/16" x .030"; 20E x 15/16" radius ground on the outside curve; 21EX straight blade; 11 straight blade ground on the slanted edge; 10 1" radius ground on the inside curve; 8 2" radius ground on the inside curve; 22 2" radius ground on the inside curve; 1-LD2 1/2" x .050" heavy duty blade; 1-LN3 1/2" x .050" carving blade; 1-LS1 1/2" x .050" carving blade, 1-LBG- #7 sweep gouge 5/16" cut. Handle with three way brass jaw chucking system. Magnetic carrying case. Boxed. Made in China. 4.38" overall. Stainless blade. Brown Delrin handle. 65Mn High carbon steel blades. Straight gouge, hook blade, V-Scorp blade, gouge scorp blade, chisel blade. Nickel silver bolsters and inlay shield. Boxed. Made in China. All tools are heat treated and tempered, hand forged high carbon tool steel with 3 1/2" wooden handles. Tools include: 5/16 Bt. Gouge, 9/64 gouge, 3/8 chisel, 9/64 Bt. V, 3/8 skew, and 3/8 Bt. chisel. Hang packaged. Made in the USA. 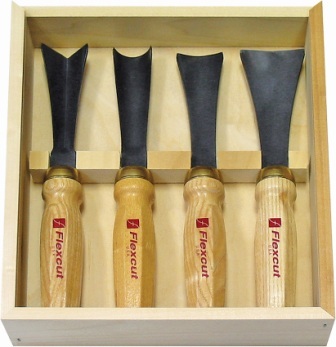 All tools are heat treated and tempered, hand forged high carbon tool steel with 2 1/4" wooden handles. Tools include: 5/16 Bt. Gouge, 9/64 gouge, 3/8 chisel, 9/64 Bt. V, 3/8 skew, and 3/8 Bt. chisel. Hang packaged. Made in the USA. 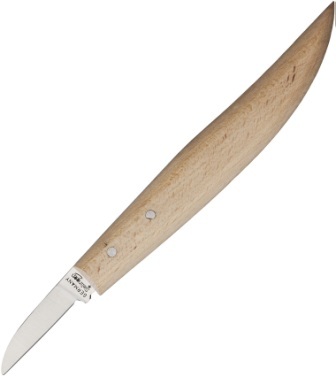 Overall: 4.25"; Blade: 2" | Tool Steel | Standard Edge; Handle: Wood; Other Info: Hand forged, treated, and tempered. 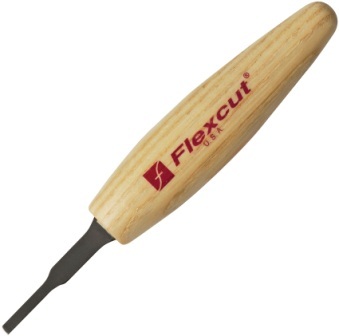 Includes 1/4 Bt Gouge, 1/8 U, 1/4 Chisel, 1/8 Bt V, 1/4 Skew, and 1/4 Bt Chisel. Hang Packaged. Made in USA. 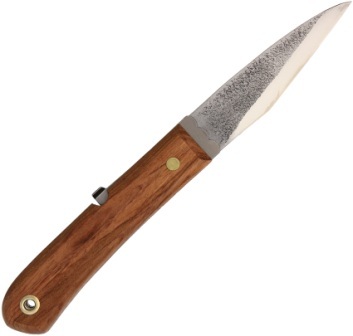 Closed: 4.75"; Blade: 2.375" | Carbon Steel | Standard Edge | Satin Finish; Handle: Wood; Other Info: Hand forged. Heat treated and tempered. 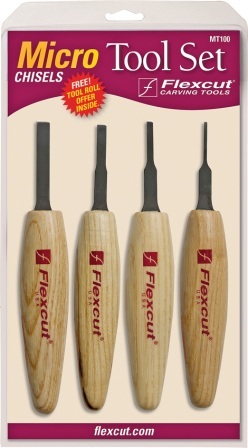 Contains: 1/8 U, 1/8 V, 1/8 Gouge, 1/4 Gouge, 3/16 Gouge, and 1/4 Skew. Hang Packaged. Made in USA. High carbon steel double tempered hollow ground blades. Includes- 4 1/2" black walnut handle with brass three way chuck holds 1/2" - 5/16" wide blades plus .200 shank gouges/tools- LD2 .050 thick x 3" long x 1/2" wide heavy duty blade - LN3 .050 thick x 3" long x 1/2" wide needle point blade- LS1 .050 thick x 3" long x 1/2" wide heavy duty straight blade - Detail blades are .030 thick x 2 1/4" long x 5/16" wide. 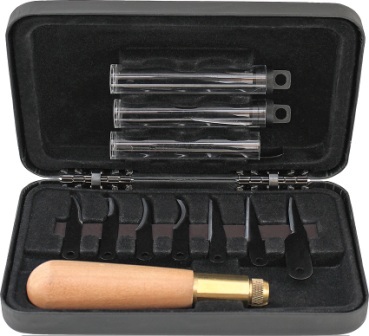 Includes 8, 10, 11, 20, 21, 22 - LAG hand forged #5 sweep gouge with 5/16" cut- Vinyl covered steel box with heavy duty piano hinge holds all tools. Made in the USA. High carbon steel double tempered hollow ground blades. Includes 4 1/2" black walnut handle with brass three way chuck holds 1/2" - 5/16" wide blades plus .200 shank gouges/tools LD2 .050" thick x 3" long x 1/2" wide heavy duty blade and detail blades are .030" thick x 2 1/4" long x 5/16" wide includes 8, 10, 11, 20, 21, 22. Made in the USA. High carbon steel double tempered hollow ground blades. 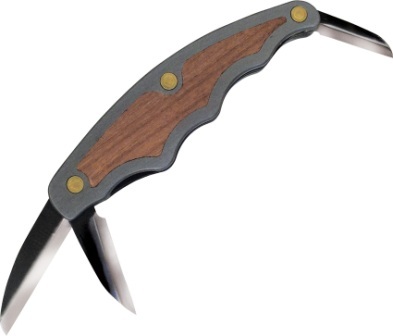 Includes one 4 1/2" black walnut handle with brass three way chuck holds 1/2" - 5/16" wide blades plus .200 shank gouges/tools; three 2 1/2" x 5/16" fine saw blades; three 3 1/8" x 5/16" heavy duty saw blades; one lock-jaw wrench. Made in the USA. High carbon steel double tempered hollow ground blades. Detail blades are .030 thick x 2 1/4" long x 5/16" wide. Includes 8, 10, 11, 20, 21, 22. Made in the USA.